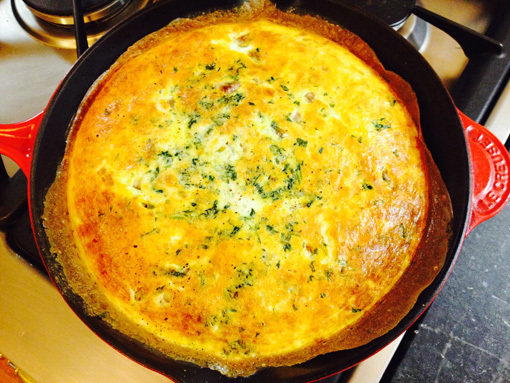 I made this frittata recipe for the adults and was happily surprised when my children begged for some, then chowed down large quantities. My son renamed it Egg Pie. Preheat oven to 350F. Whisk eggs. Add milk and whisk again. Mix in kale. Stir in cheese. Stir in sausages. Add to 12” cast iron pan that has a small amount of olive oil rubbed on it. Cook for 15 minutes, or until top is browned. The browning seems to be part of its allure to children, so watch not to overcook. It’s easily adaptable to being vegetarian, or to whatever is in your refrigerator. Share your substitutes in the comments!